The article below appeared in the Railway Magazine in January 2000 and is reproduced with their permission. The pictures are not included, since the quality in my photocopy of the article is not ok – and in any case I have no idea of their copyright status. THE fact that two glorious centuries of British railway history are, by all accounts, being virtually ignored by those selecting exhibits for the Millennium Dome is all the more unfortunate insofar as much of the controversial structure is built on the site of a former railway. As the former home of East Greenwich Gasworks, the Thames-side peninsular on which the Dome and its surrounding complexes stands was once a network of railway lines, worked by fleets of steam, diesel and electric locomotives. Built by the South Metropolitan Gas Company in about 1886, it was one of the largest gasworks in the country, rivalling the giant Beckton plant on the north side of the Thames. running on standard gauge tracks, were built to an oversize loading gauge and were used on a separate system to haul large hopper wagons filled with red- hot coke from the gas retorts. These were moved a short distance to quenching bays, where they were doused with water. Such systems existed in a number of the larger gasworks producing town gas from coal. These plants have long since disappeared, but identical systems are still used in coke ovens at some iron and steel works and at a few other coal by-products works. phase ac traction, with power taken from three wires located at one side of the track (the running rails were not used for traction current). At least one example of the type is preserved, at Leeds Industrial Museum: it was built by Greenwood & Batley of Leeds, but the ones at East Greenwich were built by Wellman Smith Owen of Darlaston, Staffs, which only built locos of this type. LMS No. 11243. This had worked on the construction of Southampton Docks before going to Charlton and is now preserved by the Keighley & Worth Valley Railway. Although it didn’t work on the East Greenwich gasworks site itself, surely space could have been found in the Dome for such a small loco? The’ second visit was to the gasworks, where three diesel, were at work on the main system. One was a Drewry/ Vulcan Foundry O-4-ODM, effectively a shortened version of BR .Class 04. The others were unusual 0-4-0DMs, built for Drewry by the small firm of Baguley, in Burton-upon-Trent (Drewry never built its own diesel locos). These locos would have produced about 150hp and were painted in a bright blue livery with yellow lining. Inside the locoshed was the works’ last steam engine, a Peckett 0-4-0ST with an unusual short saddle-tank (most Pecketts had full-length saddle-tanks). This seemed to have been kept for sentimental reasons and it was pulled out by one of the diesels to be photographed. This visit, and especially the sight of the coke-discharging, has always been a vivid memory for me. Gas works played an important part in the industrialisation of this country and most had interesting and well-kept industrial shunters. No doubt the Millennium Dome will be an improvement on the long-disused site – but it is doubtful whether it will contain anything as spectacular as a gas retort and coke car. The following article dates from 1969 and comes from the PLA Monthly – although Greenwich isn’t mentioned in it clearly much of what they are describing took place at the site we now call Enderby Wharf. I have put some footnotes to update some items. The article is by Brian Dynevor and reproduced by permission of the PLA. I have not reproduced the photographs from the original article, most of which were copyright of Cable and Wireless. EIGHTEEN THIRTY-SEVEN WAS A GREAT YEAR FOR modern telecommunications. It was the year of the first practical electric telegraph system – Cooke and Wheatstone’s – and the year that two young Americans, Samuel Morse and Alfred Vail, perfected the Morse Code – the code of dots and dashes whose “V”, dah, dah, dah, daah, “for Victory”, in the guise of the opening notes of Beethoven’s Fifth Symphony, was beamed by the BBC to the countries of Occupied Europe throughout the Second World War. These new inventions were heralded in Britain, then at the peak of her power; for though the electric telegraph had opened up communications in many countries, news from overseas could travel only as fast as the swiftest ship. So, plans were laid for the manufacture of the first submarine telegraph cable. 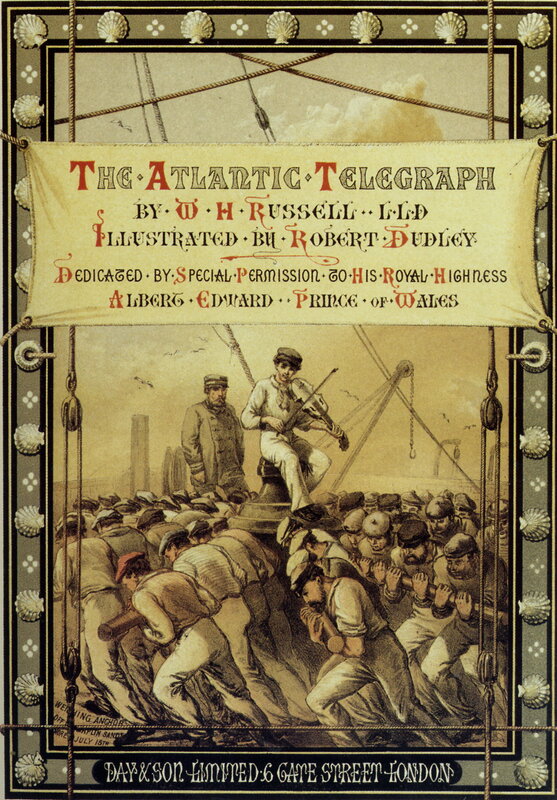 The first submarine cable was manufactured on the Thames (1) by the India Rubber and Gutta Percha Company – later merged with Glass, Elliott and Company to form the famous Telegraph Construction and Maintenance Company – and laid between England and France in August, 1850. Signals were exchanged for a few hours on the 28th but most were unintelligible because it was not realised then that cable immersed in water has entirely different transmission characteristics from a cable on land. Unfortunately, there was no time for any remedial action to be taken – the same night a French fishing vessel fouled the cable, hauled it aboard and severed it with an axe. 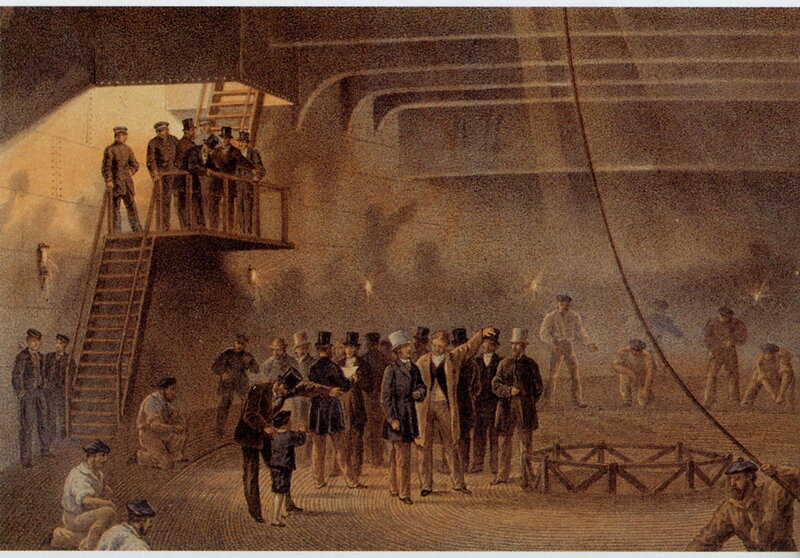 But the first step towards rapid global communications had been taken and the following year, a much heavier cable, protected with galvanised iron wire armouring, was loaded at Wapping aboard the hulk Blazer which, in the tow of two tugs, laid a successful cable across the Channel that remained in use for many years. The maintenance and laying of the world’s cables has been and is being undertaken by specially designed cableships. Here again, the Thames has a traditional link with these vessels and London is today the location of the head office of the owners of the world’s largest cableship fleet, Cable and Wireless Ltd.
Before discussing that company’s fleet, however, a word or two about the most famous cableship of all – the Great Eastern – will help to trace the evolution of some of today’s ultra-modern vessels. Just downstream of the closed Millwall Dock entrance is a commemorative sign that marks the launching spot of the great ship (3). Originally intended as a passenger liner for the Far East and later, the North Atlantic trade, the Great Eastern was a commercial failure and six years after her launching in 1858 was for sale at an auction in Liverpool. By that year, 1864, Britain was in submarine cable contact with Ireland and the Continent. For some years the possibility of putting Britain and America in direct telegraphic contact had been under consideration. Two attempts by HMS Agamemnon and other vessels in 1857 and 1858 to do just this were unsuccessful, but the hoped-for link was never far from visionary eyes. 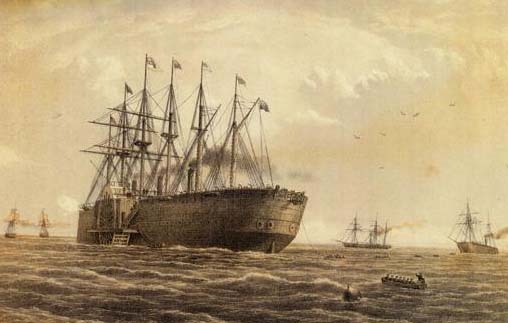 The Great Eastern was therefore purchased by Daniel Gooch who immediately chartered her to the Telegraph Construction and Maintenance Company which had already made an offer to the millionaire American newspaper and cable pioneer, Cyrus West Field, to make and lay an Atlantic cable. laying and repairing cables (the first was the H. C. Oersted, a small vessel of under 800 tons built in Copenhagen in 1872 and named after an electric telegraph pioneer); in any case, the vessel that undertook the laying of the Atlantic cable had to be large enough to carry the enormous load involved. The Great Eastern was an obvious choice. Four or five times larger than any ship then afloat, she displaced 22,500 tons. To carry the cable, three tanks were built in the fore, main and after holds and the fourth of her five funnels was removed. This provided enough coiling space for 2,489 n.m. of cable. The cable paying-out gear installed in the vessel was similar to that used in HMS Agamemnon (i.e. two four-grooved drums arranged in tandem, the cable passing backwards and forwards around the drums), except that, on the Great Eastern, six-sheave gear was used immediately before the main paying- out drums. 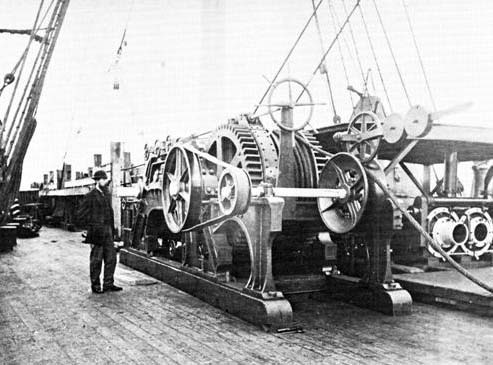 Unfortunately this machinery could not pick up at all and the cable had to be transferred to the bows for the first of the Great Eastern’s attempts to lay the Atlantic cable. But even up forward, the cable machinery failed several times during picking-up and grappling operations. Bits of bad luck constantly hampered the 1865 attempt and finis was spelt when after 1,300 miles had been laid, the cable broke and sank in 2,000 fathoms of water. A second attempt was made a year later – this time successfully. Certain alterations were made to the machinery before the 1866 expedition. Quoting Mr. Haigh again we discover that “a 70-h.p. steam engine was coupled to the after gear so that it could be used for picking-up purposes and avoid the complication of transferring the cable to the bows. Modifications were made to the jockey wheels on the six-sheave gear – the spindles on which the wheels ran were mounted on lever arms which could be loaded with weights to vary the retardation applied to the cable before it reached the main drum … “. Atlantic after the initial successful lay and grappled for and raised the cable lost the year before. This was spliced through and two Atlantic cables came into operation the same year. 1870 she laid the Bombay-Aden cable for the British- Indian Telegraph Company and in 1873 and ’74 laid two more Atlantic cables for the Anglo-American Telegraph Company. The 100 years that have passed since the Great Eastern linked Europe with North America have seen many changes in the designs of both cableships and submarine cables. The advances in cable design have already been told in the PLA MONTHLY. Cableships, however, don’t seem to attract much publicity – except on such occasions as when cs Retriever of the Cable and Wireless fleet saved over one hundred passengers and crew from a foundering freighter off Fiji in October 1967. The Cable and Wireless fleet, as already mentioned, is the largest in the world. It consists of five cable repair vessels – the Retriever, Cable Enterprise, Recorder, Stanley Angwin and Edward Wilshaw -and the cable-layer cs Mercury. The fastest cableship in the world. All the Cable and Wireless fleet, except Mercury, are on continuous duty at points along the £60-million Commonwealth cable system. Mercury, of course, isn’t idle either. When not relieving the five repair vessels while they go for annual refits away from their bases at Gibraltar, Singapore, Fiji, Rio de Janeiro and St. Lucia, she may be anywhere in the world at any given time. This year, with the help of the John W. McKay (4) (owned by the Commercial Cable (Marine) Co. Ltd.), she laid the first half of the South Africa- Lisbon cable which, at the Portuguese end, will link up with the projected TAT V and MAT I cables, so bringing South Africa into submarine telephone cable contact with the rest of the world. The forward cable machinery was supplied by Johnson and Phillips and consists of a double combined paying-out and picking-up machine, electro- hydraulically operated. The after paying-out gear, supplied by Submarine Cables, is a five-sheave machine. The vessel can be controlled from the bridge, bow or stern. Each position has direct control of the propellers, steering and transverse bow thrust unit. Practically the whole of Mercury’s upper deck is devoted to cable work. The forward and aft cable machinery is here; there are three repeater stowage racks adjacent to the cable tank hatches; a repeater trough runs from the forward tank to the stern chute. As well, the transmission test room, equaliser test room, etc., are to be found on this deck. Mercury, on passage, steams at 16 knots, has accommodation for 159 officers and crew and is of 8,962 gross tons. Though the basics of cable-laying have not changed very much since the Great Eastern’s day, the electronic sciences – such as navigation and survey work – have. Mercury, as one of the most modern vessels, of any class, in the world, is chock-full of such equipment as radar, depth-sounding units, direction-finder, electric logs, gyro compasses and the like. A far cry from the stars, sun, sextant, hand- held plumb line and the wetted, up-raised finger of mariners in the 1860’s! Since the late 1950’s vessels belonging to Submarine Cables Limited, the GPO and Cable and Wireless Limited – all London based – have helped to circle the earth with submarine telephone cables. One of the cables involved is SEACOM – an extension of the trans-Atlantic and trans-Pacific cable systems – whose 7,070 mile length links Singapore, Sabah, Hong Kong, Guam, New Guinea and Australia. The section Guam-Australia has 160 voice circuits; the rest is of 80 voice circuits. In Australia, SEACOM connects with COMPAC and CANTAT across the Pacific and North Atlantic, via Canada to the United Kingdom. Both the latter cables are of 80 voice circuits. The Commonwealth system is a partnership between Britain, Canada, Australia, New Zealand, Malaysia and Singapore and of its £60-million cost, almost £24 million was provided by Cable and Wireless Ltd. Within the confines of this article, it is impossible to deal adequately with the vast subject of submarine cables – and the part played by Thames-side. It is a bit like Baked Alaska – turn the heat on and it won’t stop rising. The author is grateful to Messrs. Baglehole, Slape and Miller of Cable and Wireless Ltd. , all of whom helped considerably in the preparation of this article. (3) the famous sign painted on the wharf wall to mark the launch site of the Great Eastern disappeared in the 1990s. There have been efforts to reproduce it. There is however a small exhibition on the riverside. (4) The John W.McKay lay alongside Enderby’s for many years as a relic of cable laying days. Eventually she rusted away and was taken to Scotland to be broken up. And thanks to PLA for consent to reproduce this – and to Sally Maschiter in particular. The cutting comes from the Kentish Mercury, date not clear but probably 1890.